The Qdoba restaurant on Forbes Avenue has drizzled its last queso and handed out its final free student drink. The owner, Chad Brooks, said the closure was a corporate decision. He said a new restaurant called Crave-A-Bowl will open a test location at the storefront on Forbes between Oakland Avenue and Atwood Street. Brooks added that he is just as sad to see it close as students are. Olivia Phillips, an undeclared first year, was furious when she saw the sign Wednesday night. “What the hell, this is not OK. What’s wrong with them?” she said. Colin Woodruff, a first-year chemical engineering major, pointed out there was a Chipotle across the street. “Yeah, but it’s not the same,” she said. 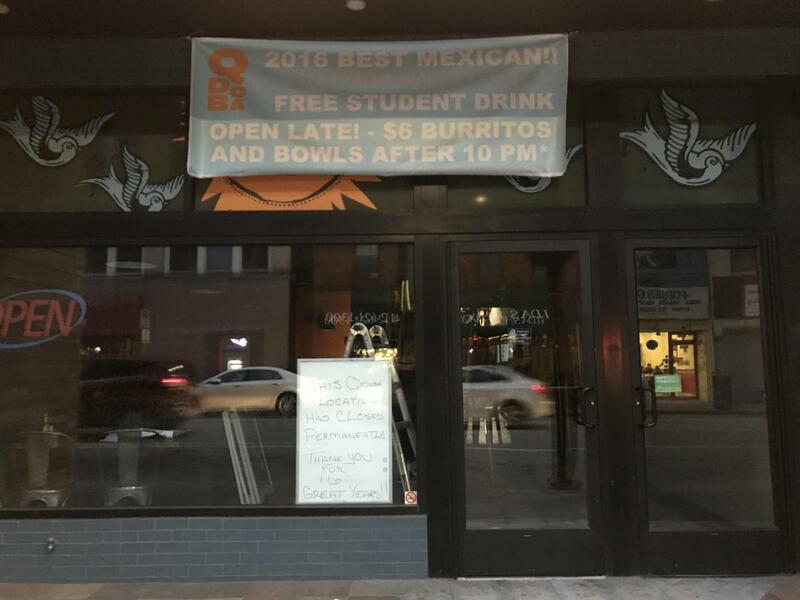 Other students had reactions similar to Philips and Woodruff upon seeing the closing sign in Qdoba’s window. Friends Julia Hartigan, a junior math major, and Erica Fan, a junior philosophy major, both stopped and gasped upon seeing the sign. Fan said she was shocked since she had heard the venue was closing but thought “it was just a rumor.” Hartigan was speechless. Andrew Klang, a junior applied math major, stopped in his tracks and stared, mouth agape, when he saw the closing sign. He said he went to Qdoba five to six times a month last year and was surprised that a place that had hundreds of customers every day would close. Some students found out about the news the hard way. Etienne Ayoub, a junior computer science major, had come to Qdoba intending to cash in on the Wednesday student discount when he saw the sign. Mohit Jain, a junior computer science major, said he was used to coming to eat at Qdoba about four times a week and likewise considered it better than Chipotle. “It seemed like a steady fixture, like 7/11,” the first-year English literature major said. Halee Peloso, a senior rehab science major, had only been to Qdoba a few times. But she was surprised it was closing so soon after the remodeling following the incident less than two years ago, when emergency workers drilled a hole in the wall to rescue a student who fell between two buildings trying to impress a woman. Facebook user Eric Goldhorn started an event page for a “candlelight vigil” to be held in front of the restaurant Sunday at 8:30 p.m.